Wellness is the optimal state of health and well-being of individuals and groups. It is the ability of people and communities to reach their fullest potential, both in terms of health and fulfillment of purpose. We are all part of achieving a healthy New Brunswick where, together, we can live in a culture of wellness. New Brunswick’s Wellness Strategy supports action on all dimensions of wellness and all determinants of health. 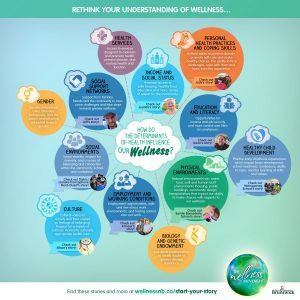 Whichever aspects of wellness you would like to learn more about, you can find lots of resources on this site – many provided by The Wellness Movement partners, with contact information so you can reach out to them directly. The people, places and other factors in your life that support your wellbeing and help make healthy choices more accessible. Wellness-supporting environments are found in all areas of your life! Wellness is about more than individual lifestyle choices. It is shaped by the people around us and the places where we live, learn, work and spend our free time. Just like a tree, wellness needs the right conditions to grow. These people and places form the supportive environments that nourish our wellness like soil, water and sunshine. Creating a supportive social environment in a home, community, school or workplace means building positive relationships that nurture the emotional well-being of everyone involved. When we feel supported by others, we are more likely to make healthier choices. Creating a supportive physical environment means designing buildings, grounds, indoor and outdoor play or rest spaces in and around our homes, communities, schools or workplaces that are safe, encourage people to connect with each other, are accessible to everyone and support healthy choices. When the social and physical environments (the people and places) around us are supportive of our wellness, we are more likely to be healthy and resilient and enjoy a great quality of life! There are many success stories about how people in New Brunswick are creating supportive social and physical environments for wellness. The Wellness Movement celebrates these efforts and inspires further action to create supportive environments in our homes, communities, schools and workplaces so people throughout New Brunswick can make healthy choices and are empowered to thrive! Every wellness story starts with a single step. 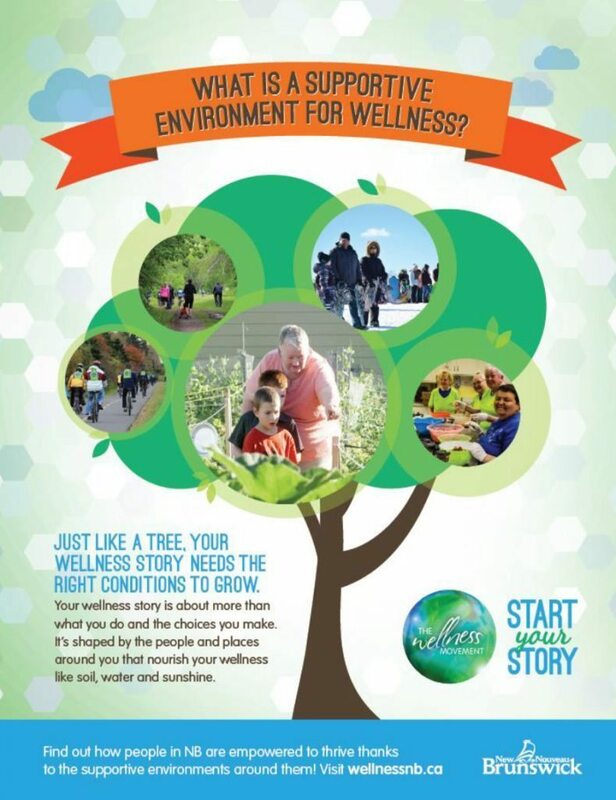 See how New Brunswickers just like you were inspired to start with small changes to achieve greater wellness. Wellness events happen all over New Brunswick. Click here or visit the Events Calendar section to see what’s happening near you! A web section with resources specifically intended for seniors and their caregivers. For resources, tools and references focused around workplace wellness. Ready to take action for yourself and those around you? Want to get involved with The Wellness Movement?